Write a letter to support Indigenous REDD and stop carbon cowboys! 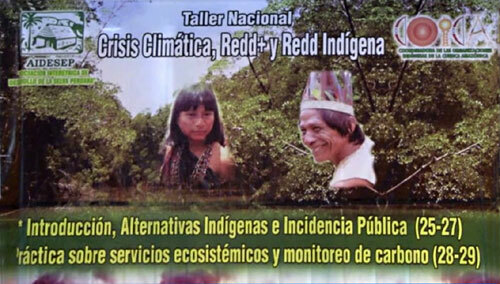 During the National Workshop “Climate Crisis, Redd+ and indigenous Redd” COICA, AIDESEP, and twenty other indigenous organizations issued the Declaration of Iquitos. In this historic document, AIDESEP proposed Indigenous REDD that respects the cultures, rights and objectives of indigenous people. In addition, they denounced and rejected the Hong Kong company of David John Nilsson (a "carbon cowboy") and demanded his expulsion from Peru. Currently, scammers are cheating native Amazonians out of their land under the pretext of creating REDD (Reducing Emissions from Deforestation and Forest Degradation) projects. These unscrupulous businessmen have been termed "Carbon Cowboys." While they say that they want to protect the forest, what they really want is to get the land for free and cut down the forest and replace it with palm oil plantations. They lie and say that they are representatives of the United Nations and the World Bank and promise the communities "billions of dollars" from carbon offset credits. Using these tactics, they trick vulnerable and trusting people into signing unfair contracts with hidden clauses giving the scammers a power of attorney that essentially gives these conmen the forest for free, allowing them to harvest the timber and replace the native forest with monocultures of palm oil trees. Please write to your government officials and to the Peruvian government supporting Indigenous REDD and raising your concerns about conmen cheating native and rural communities under the pretext of a REDD project. I would like to express my support for Indigenous REDD as proposed by AIDESEP, the national indigenous organization of Peru. I am extremely concerned about the adverse environmental, health and social consequences of REDD and REDD+ on native and rural communities in Peru. Currently, dishonest businessmen are tricking native and rural communities into signing unfair contracts with hidden clauses that essentially give their land away to these unscrupulous people for free. Please support the initiatives of AIDESEP and the association Friends of the Amazon (www.friendsoftheamazon.org) to prevent these so called "Carbon Cowboys" from gaining control of the Amazon Rainforest under the pretext of REDD projects. I recommend for you to take immediate steps to prevent vulnerable native and rural communities from signing away their forest to these "Carbon Cowboys" with unfair contracts. Any contracts signed should be model contracts approved by the national indigenous organization AIDESEP (Asociación Interétnica de Desarrollo de la Selva Peruana), and communities should be provided independent attorneys by INDEPA (Instituto Nacional de Desarrollo de Pueblos Andinos, Amazónicos y Afroperuanos) to protect their rights. I urge you to deport David John Nilsson from Peru who is a self-professed "Carbon Cowboy." In addition, I advise you to support amendments to the current law on Free, Prior, and Informed Consent (FPIC) in Peru to include private businesses. Under current laws, FPIC only applies to the government. The laws needs to be changed to include both private enterprises and NGOs (Non-Governmental Organizations) in order to protect the territory and rights of vulnerable native and rural communities. Verónika Mendoza Frisch, Congresswoman in Peru who is opposing "Carbon Cowboys"
Stop deforestation in the Amazon! Support the Friends of the Amazon's Stop Deforestation in the Amazon Program by working directly with us or by writing a letter to governmental officials. For more information on our how you can write a letter to government officials or to find out how you can prevent the destruction of the Amazon Rainforest, please contact us using the email address below.